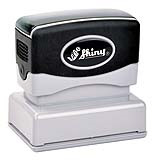 We are excited about our Shiny Custom Preinking stamps. Beautiful in design and functionality. They come in a wide variety of sizes to choose from. 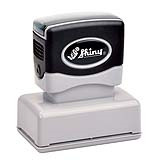 Design Your Own Stamp now using our Design A Stamp online proofing stamp system. You choose your stamp text, design and color. Like what you see? Order it, and we will create it today. Choose a convenient shipping option to meet your requirements. 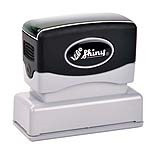 Next Day Stamps offers a wide selection and sizes of Shiny Custom Pre-Inked Stamps. The most popular stamps are ready to customize and order below. 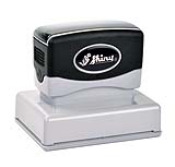 Address stamps - Round stamps - Stamps for teachers - stamps for kids - Signature stamps, - Notary stamps - Endorsement stamps - Deposit stamps for Financial Institutions - Pre-Inked business stamps - Monogram stamps - QC inspection stamps - Engineer Seal Stamps. Order today for same day shipping or choose overnight shipping for One Day Delivery! 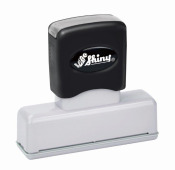 Impression Area: 1/4" x 2-1/2"
a check easy and prints a beautiful imprint on the check. Impression Area: 9/16" x 1-3/4"
Impression Area: 5/8" x 2-3/16"
oil based ink which doesn't evaporate thus the ink lasts longer. Impression Area: 3/4" x 1-15/16"